Small businesses that are hiring but that don’t have dedicated human resource staff may want to take a look at Workable, a SaaS-based software system that automates the hiring process, from job posting through candidate hiring. 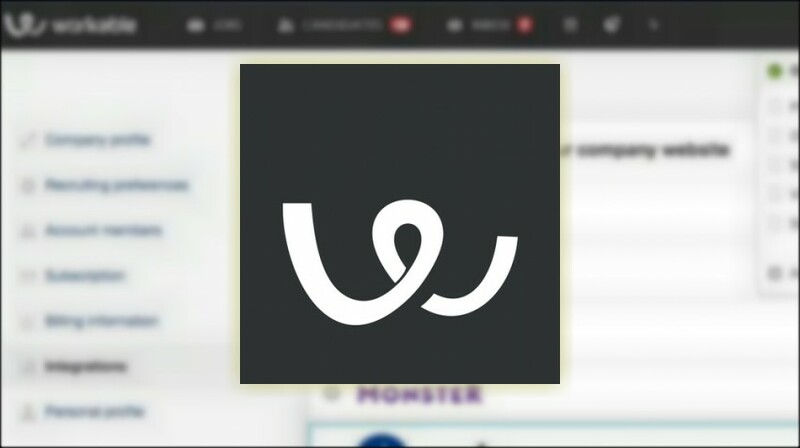 Workable provides a way to place a job listing on a business’s branded job page quickly and broadcast it to a large number of job sites with a single click. When candidates complete an application, Workable tracks them, manages the interview process and collects analytical data, all at a price far less than hiring an HR person. Workable is equally suited for use by businesses with 15-20 employees hiring a couple of people periodically throughout the year and for companies with up to 500 employees hiring at all times. Workable’s “genius” is its automated workflow process that significantly reduces the need for manual intervention. In fact, according to Workable VP of Communications, Daniel Howden, the only data entry required comes in writing the job description. In the jobs dashboard, businesses can see the number of applicants at each stage, interact with them via a Facebook-like timeline and email candidates, either individually or in bulk, as the need requires. Improving the process through onboard analytics. Once you sign up, which you can do using your LinkedIn or Google profile, Workable presents you with a page containing three options: Create a job, invite people to your team and create a careers page. Create a job: Clicking the “Create a New Job” button takes you to the job description page. Enter the job details, which include the description, job requirements, benefits and any other relevant details. 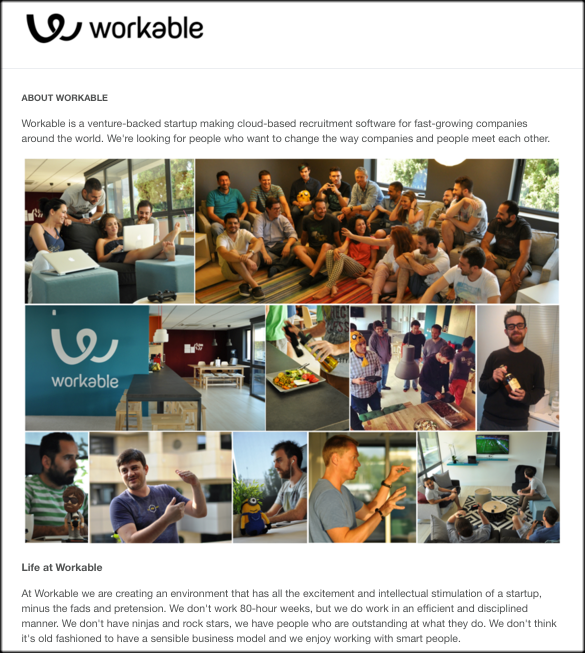 Workable provides a library of more than 300 customizable job templates from which to choose. Find one best suited to the job in question and edit it accordingly. When completed, customize the application form to match the look of your website, and then advertise the position on job boards and social media. Invite people to your team: Workable allows you to invite an unlimited number of people to join your hiring team, including other employees and outside recruiters. 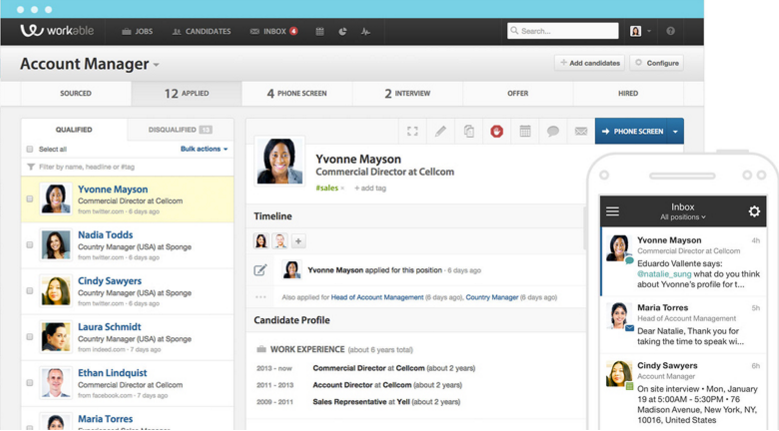 Team members can leave notes, comments and evaluations, which the system keeps in the candidate’s timeline. Create a Careers Page: Click the “Create a Careers Page” button to set up a page that contains your company profile and all job listings. You can insert your company logo and other images to personalize the page, and add a jobs tab to your Facebook Page if desired. When you add new positions, both the careers page and jobs tab update automatically. Workable lets businesses post to 15 job boards with a single click. These include free sites such as Indeed, SimplyHired and Glassdoor, as well as premium sites like Monster and Career Builder. Regarding premium sites, Workable purchases job listings in bulk, at a discount, and passes the saving on to its users. For example, a listing on Monster that might cost $375 when purchased individually is reduced to $225 thanks to the bulk purchase program. Workable also enables businesses to post jobs to social media — Facebook, Twitter, Github and Dribbble specifically. From the candidate’s perspective, applying through Workable’s system could not be easier. It’s a one-page application, and applicants can even apply using their LinkedIn profile, to expedite the process. Each day, you receive an email listing new applicants. The platform is also mobile-friendly, which means you can look at who has applied while on the go. One of the primary benefits of using Workable is its pipeline-style process that enables you to move prospects through up to nine stages. These include: sourced, applied, promising, phone screen, assessment, interview, executive interview, offer and hired. You can also customize the number of stages, to better fit your process. All candidate applications go into Workable and appear on what the company refers to as the Applicant Tracking System (ATS). If an applicant attaches a CV, Workable reads it and breaks it down into standardized and comparable data. 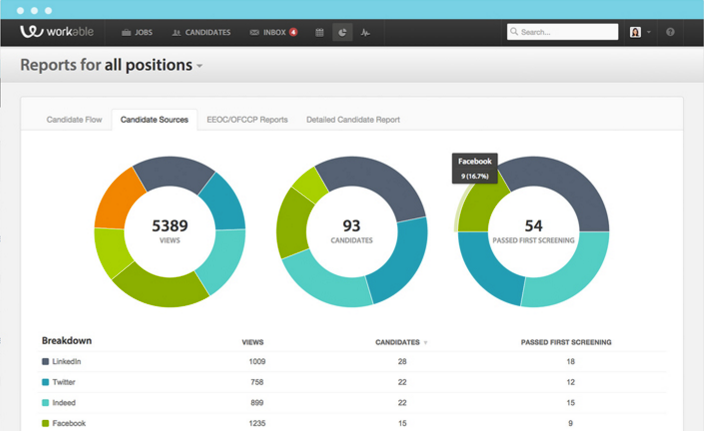 The system also picks up candidates’ public profiles and matches them to the application to provide a 360-degree view. You get a clear idea of who applicants are, on a single page, and can sift through the list quickly, disqualifying those who are not well matched to the job and move qualified candidates to the next phase. Scheduling interviews can, perhaps, be the most difficult part of the hiring process. 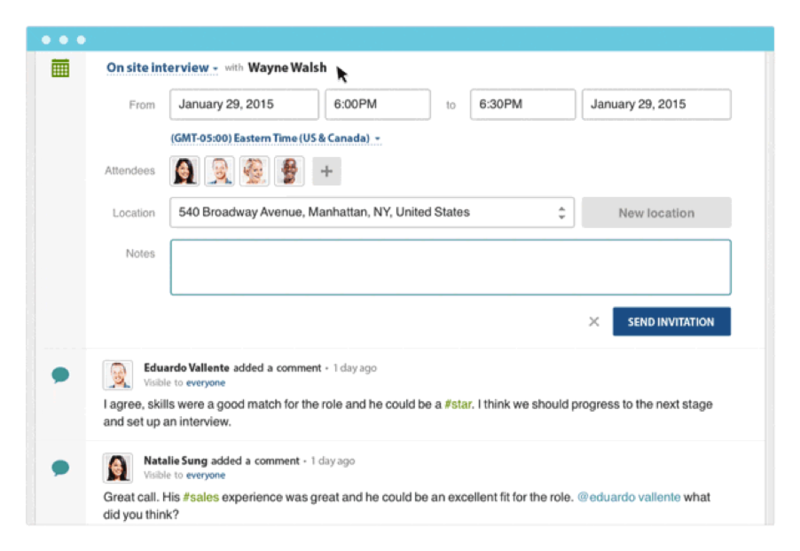 To make this easier, Workable enables you to set up calls or interviews with candidates and invite team members. It also works with your own email system and calendar, so you don’t have to be logged into the dashboard to track and coordinate multiple interviews. Trackable feedback and notes make preparing for interviews simple and straightforward. You can see all previous interactions with candidates, as well as their social media profiles, resume and communications in the timeline. Candidates’ screening tests or assignments, as well as your hiring team’s feedback, are housed in the same place, together with any follow-up from the first interview. Workable’s onboard reporting and analytics give you an overview of progress related to open and closed jobs, track where the ablest candidates came from and which job boards are providing value for the money. Filters break down and export data in a variety of formats, including .CSV. The reporting component adheres to Equal Employment Opportunity Commission laws and Office of Federal Contract Compliance Programs regulations, automatically collecting hiring data and producing compliant reports. Workable makes it easy to manage any volume of applications, provides a standardized process that small business may otherwise lack, and do so at prices ($39 per month) any small business can afford. NEXT POST Next post: Twitter Moments Review – Should Small Businesses Care?